Last month I shared with you the newest page on our website, a list of some of the Free Resources we are eager to have you use. In that post I focused on Tools for Training and Education. Links to a series of articles on food, language and values, including Chinese, French and Japanese. Perhaps you’d like to add one of your food fetish languages to the mix? Send your article to us and we’ll consider it! The inside scoop on “Tiger Moms,” written by the co-author of Cultural Detective South Korea, Eun Young Kim. Please use these complimentary resources frequently and well, so that together we can develop intercultural competence in our organizations and communities, thereby building respect, understanding, collaboration and justice! 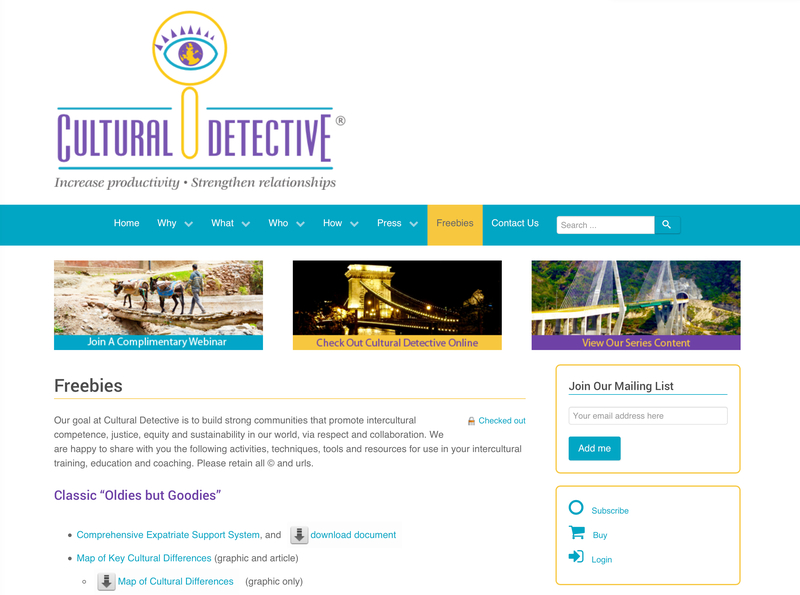 This entry was posted in Downloads/free gift and tagged Cross-cultural communication, cross-cultural skills, Cultural Detective, diversity and inclusion, Education and Training, global business effectiveness, global diversity, Intercultural Communication, intercultural competence, multicultural society by Dianne Hofner Saphiere. Bookmark the permalink.